Taika Waititi and Jemaine Clement’s vampire comedy, What We Do in the Shadows, has been given a series order at FX. Those who enjoyed Taika Waititi’s feature film (and who discovered his unique brand of humor after enjoying Thor: Ragnarok) will be happy to learn that his vampire, buddy mockumentary will be getting a television adaptation. The film told the story of a bunch of vampires sharing a flat together and experiencing the ups and downs of daily life. The new series stars Matt Berry (The IT Crowd), Kayvan Novak (Four Lions), Natasia Demetriou (Year Friends), and Harvey Guillen (The Magicians). Clement and Waititi will executive produce with Paul Simms, Scott Rudin, Eli Bush, and Garrett Basch. 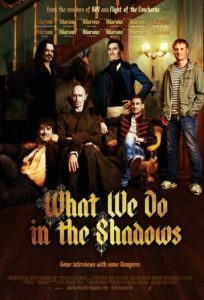 What We Do in the Shadows will premiere on FX in spring 2019.